I just completed an extraordinarily smooth and successful two-day recording session with pianist Sarah Cahill for my upcoming New Albion CD. Tom Lazarus is the recording engineer, with a resumé of hundreds of great discs behind him. (One of his credits was the last recording made by Vladimir Horowitz, which made me expect he’d be a bearded patriarch; actually Tom’s my age and looks younger, and we kidded him about having worked with Horowitz at age seven.) We recorded three works: Private Dances, Time Does Not Exist, and On Reading Emerson. In a couple of weeks I’ll record two more pieces for the disc with the Da Capo ensemble and my son Bernard. I had never heard On Reading Emerson before, aside from my own halting attempts to muddle through it, and I’ve been nervous about committing to disc a piece that I haven’t heard with an audience. Listening to your music with an audience is like going over it with a microscope, and sometimes at world premieres I smack my forehead and suddenly realize what I should have done instead. But Sarah plays the piece so gorgeously that she won me over to it. To make it scarier, On Reading Emerson, stream-of-consciousness and mercurial, is not my typical style. Sarah commissioned it for an Emerson conference she attended, and while I normally settle into a steady-state postminimalism, there was nothing postminimalist about Emerson. As Emerson so often quotes other writers, the piece wanders into motivically related quotations: from Busoni, Ives, and MacDowell, plus a phrase from an incomplete song I started in college to Emerson’s poem “Rhodora.” And since I think of each Emerson essay as driven by a single idea yet ultimately all-encompassing, I derived the whole piece from a motive that keeps reappearing at the same pitch level despite changes of key – E D# C# D# (G) – and that occasionally expands into a 12-tone row, the first one I’ve ever used. (Sort of like Strauss using a 12-tone theme in Also Sprach Zarathustra to represent “science.”) I’m so happy with it and with Sarah’s performance that I’ll treat you to a rough edit, here (eight minutes). 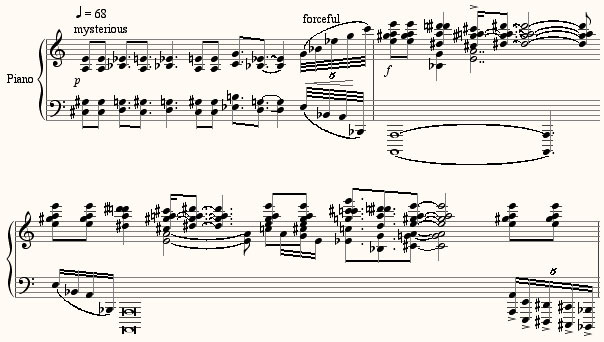 This is not the first time I’ve written a piece outside my usual stylistic habits and found it in certain ways more attractive than my more characteristic music. Morton Feldman used to have a standard assignment that he gave his students: “Write a piece that goes against everything you believe.” He found that his students wrote their best pieces denying all their usual reflexes. (Sort of like the Seinfeld episode in which he decides, since everything he does turns out badly, that he’ll do the opposite of his reflex habits from now on – and it works.) Feldman also had a standing offer to buy dinner for the student who could come up with the worst orchestration – and no one ever won, because the more they worked to come up with bizarre instrument combinations, the more interesting the results. Wow, that is a very nice piece! Looking forward to the CD when it is released. KG replies: I think you’ve got plenty of balls, Andrea. That’s different from convictions. VERY NICE!!!! Have you thought about orchestrating it? KG replies: Thanks. But who in the world would perform that? I don’t think anyone can really ever create against their convictions. It’s all in there, somewhere. This piece is like an tourist postcard thru your Emerson. Really very nice. We didn’t know you had it in you. Wouldn’t it be more instructive to think of Feldman’s music as his way of composing against everything he believed in? That would certainly shed light, at least, on the vast difference between the way Feldman looks (!) and speaks, and his music.